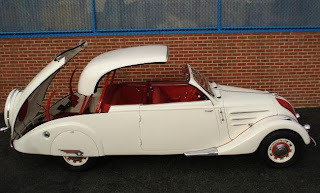 1938 Peugeot 402BL Eclipse Decapotable - There's really nothing I can write about this car. It's absolutely stunning. I've spent the last hour just looking at the details in the pictures. What an incredible car. 1972 Audi Super 90 - When was the last time you saw one of these? Have you ever seen one of these? The Audi Super 90 was based on the DKW F102. It was one of the Auto Union brands VW acquired from Mercedes in the mid-1960s. The F102 had a two stroke engine, but when VW replaced it with a four stroke engine, they dropped the DKW name and resurrected the Audi brand. It was the first car to be badged an Audi since World War II. Not many were sold in the US and the few that were gained a reputation for being trouble-prone. Most of them found their way to junkyards very early in their lives. This one was purchased by a Audi enthusiast and restored to a very high standard. The seller, in explaining why he restored this car, writes, "all cars are part of the automotive history and deserve a chance to be saved". I couldn't agree more. I think I've written those same words about 100 times in this blog. Located in Troy, Michigan, click here to see the eBay listing. 1969 Maserati Mexico - For reasons I don't understand, the Mexico's looks are criticized in almost every article you read about them. No, it's not flashy, it's not sporty and it doesn't scream "Look at me!". Vignale's design is elegant and understated and there's nothing wrong with that. With a 4.7 liter V8, the Mexico had a top speed of 155 MPH. There's nothing understated about that. The suspension was a De Dion setup in the rear and a coil and wishbone setup in the front. 4 wheel disc brakes provided the stopping power. This car is located in Italy. It has been nicely restored and has an asking price of $57,000.00. Click here to see the eBay listing.